A fews weeks ago Nick Malik released version 3.5 of the Enterprise Business Motivation Model (EBMM) (see his corresponding blog post here). On the occasion of that new release I reflected the list of frameworks and conceptual models I know for documenting business models and strategy-related parts of an enterprise architecture. modeling goals you have to select, combine and/or extend one or more frameworks/models. Hopefully your modeling tool is flexible enough to supports these operations (but this is maybe worth another post). The Business Motivation Model (BMM) describes a framework for developing, communicating and managing business plans (cp. [OMG2008, p. 1]). The common elements of business plans and their relationships are defined and described. It claims to be an simple model, i.e. the elements have only a few simple attributes and the relationsships are primary many-to-many. There are no detailed definitions and classifications of the relationships. The BMM focuses only on the motivational part of an enterprise architecture and can be used to build models that answer why an enterprise architecture is designed in way it is designed. 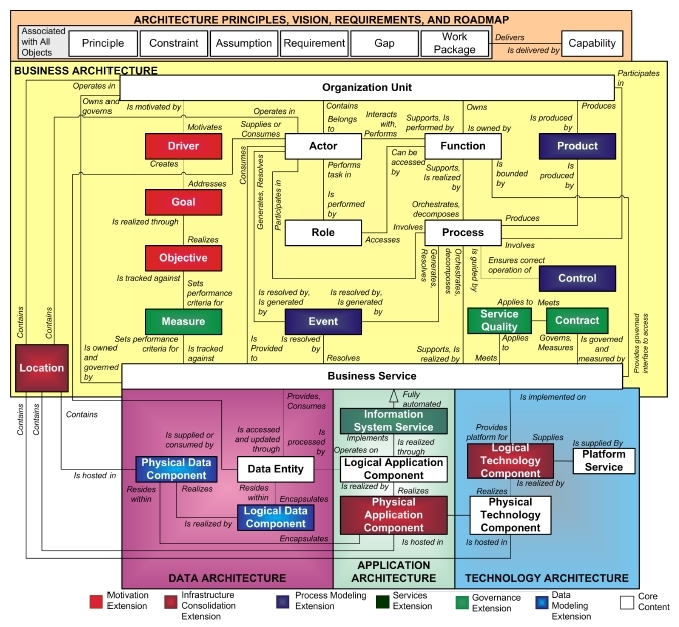 It does not describe the structural and behavioral parts of an enterprise architecture, i.e. elements like business processes, business objects, applications or technology-related components are not focused by the specification. Related to the business plans, the BMM can be used to describe a single business plan. Big and complex companies with diverse business units, business models, capabilities and different goals can not be modeled directly. TOGAF contains the Architecture Development Method (ADM) which is a methodology for developing and using enterprise architectures (cp. [TOGAF2009]). To describe the inputs and outputs of this method in a structured and consistent way TOGAF specifies the Architecture Content Framework and a Content Metamodel. This framework is aimed to be used as a startup-framework so that the ADM can be described and used (cp. [TOGAF2009, p. 361]). TOGAF recognizes that there other and more detailed enterprise architecture frameworks and meta models that can be used with the ADM and therefore replace or extend the Content Metamodel. The Content Metamodel distinguishes core content and a few optional extensions (Content Metamodel Extensions) that can be used if needed. The Motivation Extension supports the linkage to the motivational aspects of an enterprise architecture by defining the meta model elements Driver, Goal and Objective. ArchiMate Extension for Implementation and Migration (cp. [JvIQ2010]). Unlike the main ArchiMate standard theses extensions are currently no Technical Standards but only White Papers submitted to the Open Group. I suppose that both extensions will be integrated in future versions of the ArchiMate standard. Especially the ArchiMate Extension for Modeling and Managing Motivation, Principles and Requirements can be used to model the motivational parts of an enterprise architecture and describe why an enterprise architecture is designed the way it is designed. 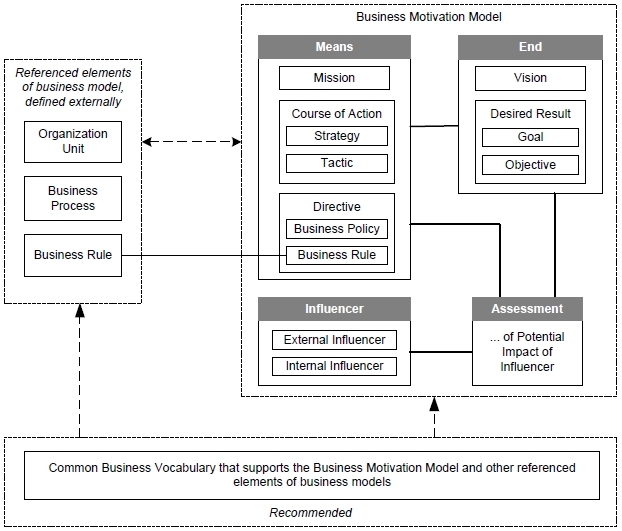 The Motivation Extension goes beyond the Content Metamodel defined within TOGAF but compared to the Enterprise Business Motivation Model (EBMM) (see below) it is quite small. It defines the elements Stakeholder, Concern, Assessment, Goal, Principle and Requirement and the relationship types Aggregation, Realization, Conflict, Contribution, Specialization and Association (actually only the relationship types Conflict and Contribution are new. The others are reused by the ArchiMate standard.). The Motivation Extension has two strengths: First it defines the motivational parts of an enterprise architecture and a corresponding notation (analogous to the ArchiMate standards which describes the content and notation too). Second it smoothly integrates with the structural and behavioral parts of an enterprise architecture specified by the ArchiMate standard. It can be used to explicit model why a structure and/or behavior is designed the way it is designed. Particularly the motivation part of the enterprise architecture can be linked to the structural and behavioral part. The Requirement element is the primary connection to the structural and behavioral part and can be linked to any structural or behavioral element to model that a single or a group of elements realize a requirement (cp. [QuEJ2010, p. 17]). The Enterprise Business Motivation Model (EBMM) was developed by Nick Malik, an Enterprise Architect from Microsoft, in cooperation with several practitioners across various companies and industries (cp. [Malik2011]). The EBMM has a strong focus on the motivational part of the business architecture and for that part supports the modeling of big and complex companies with many business units implementing different business models, capabilities and goals. Other structural and behavioral parts are in scope but are considered only rudimentary. On the highest abstraction layer the EBMM defines the elements Business, Business Unit, Business Process, Directive, Assessment, Business Model, Business Capability, Data Object, Influener, Driver, Initiative and Application (cp. [Malik2011, p. 14 ff.]). The relationships are based on a few general connection types and define the specific semantics in the context of the model. The EBBM defines no notation for a graphical representation of its elements and relationships. If you want to document business models and strategy-related parts of a business architecture take an in-depth look at the frameworks and conceptual models reviewed in this post. 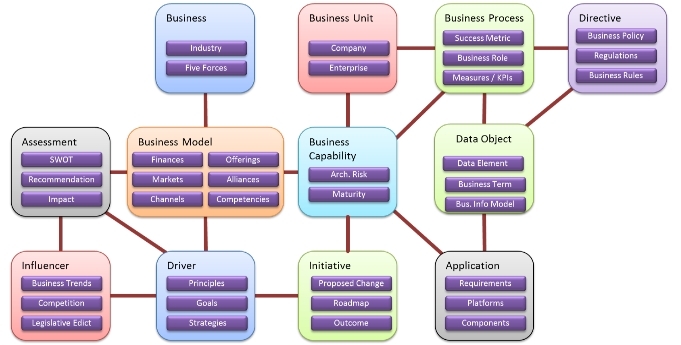 They describe the structure and elements of business models and strategy-related parts of an enterprise architecture. Especially they help you to get the big picture with respect to this modeling domain. Then depending on your modeling scope and level of detail select one framework/model and reuse the concepts and definitions as much as you can (because you shouldn’t reinvent the wheel and it takes a lot of effort to build such models from scratch). If the framework/model does not meet you modeling requirements completely, extend or combine it with other frameworks/models. Some of them – for example the ArchiMate standard – defines explicit extensions mechanisms which can be used to implement custom extensions that are in line with the standard. Particularly distinguish between the motivational and the structural/behavioral part of your model. The latter describes what the business, application and infrastructure architecture look like. It encompasses concepts like e.g. business processes, applications , servers and networks. The motivational part describes why these structures are designed the way they are. It contains elements like e.g. objectives, principles and requirements. Both views have to be interconnected to document the design decisions made in the model. [Arch2009] The Open Group: ArchiMate Specification. Technical Standard, Version 1.0, 2009. [JoPT2009] Jonkers, H; Proper, E.; Turner, M.: TOGAF 9 and ArchiMate 1.0. The Open Group White Paper, 2009. [JvIQ2010] Jonkers, H.; van den Berg, H.; Iacob, M.-E.; Quartel, D.: ArchiMate Extension for Implementation and Migration. The Open Group White Paper, 2010. 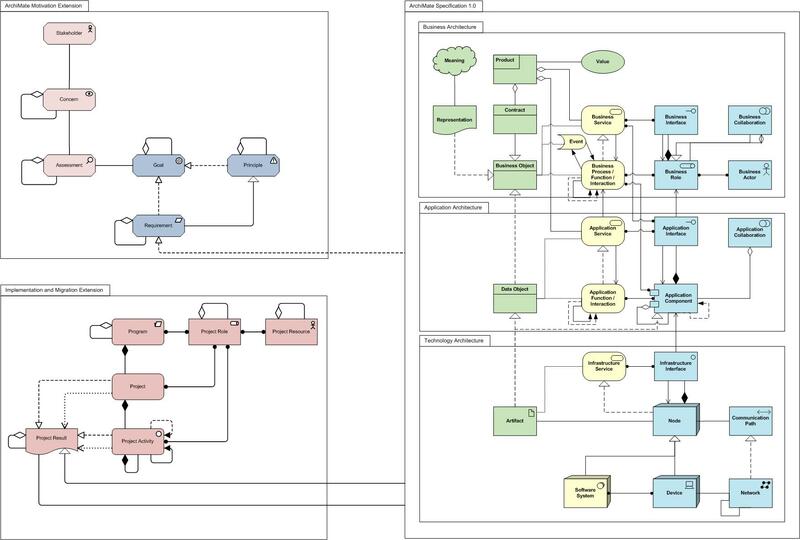 [QuEJ2010] Quartel, D.; Engelsman, W.; Jonkers, H.: ArchiMate Extension for Modeling and Managing Motivation, Principles and Requirements. The Open Group White Paper, 2010. [Malik2011] Malik, A. Nicklas: Enterprise Business Motivation Model. Full Model Documentation, Version 3.5, 2011. [OMG2008] Object Management Group (OMG): Business Motivation Model. OMG Specification, Version 1.0, August 2008. [TOGAF2009] The Open Group: The Open Group Architecture Framework (TOGAF). Version 9, 2009. Previous Previous post: Welcome to the Architectural Change Management Blog!